Early morning brought strong thunderstorms and heavy rain, and we wondered if we’d be able to get out much today. By 9:00 or so it had cleared, though, bringing bright sunshine and valleys draped in mist. We drove up to a rustic little restaurant on a mountainside above the valley of the Mostnica River for lunch, and on the way down saw this pasture high above Lake Bohinj. Although it’s been done to death, I just had to get the obligatory cows-and-mountains shot. Hope you like! 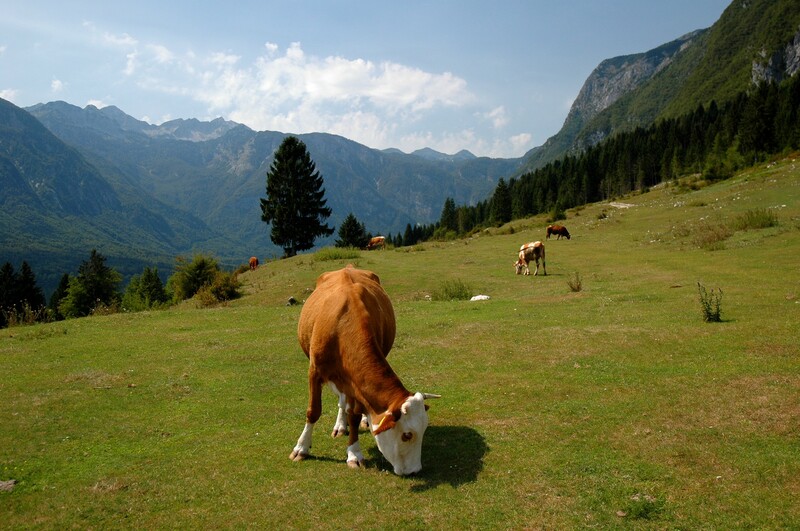 Cows and mountains: one of my favourite genres judging from a quick peruse of my own pictures.. Spend some time in Switzerland, and you’re bound to come back with cows and peaks.